The Training Class Test brought the season of training on dummies to a close, ready for dogs and handlers to move on to picking game in the shooting field. 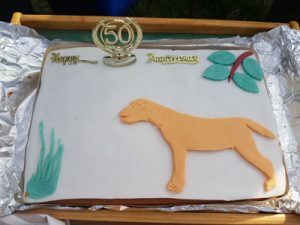 Mr Robert Bower again invited us to Manor Farm, Carburton, Notts where we had varied ground for judges David Bellamy and Anna Wagland to test the dogs. As is usual this test is unclassified and divided into three separate classes. The day was sunny and pleasant, and the undulating ground included pasture, a block of maize, and mixed woodland dissected by rides. 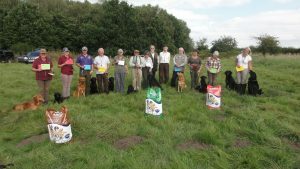 Three different breeds took part in a friendly atmosphere, with the tests designed to reflect the different stages of training for the three classes.